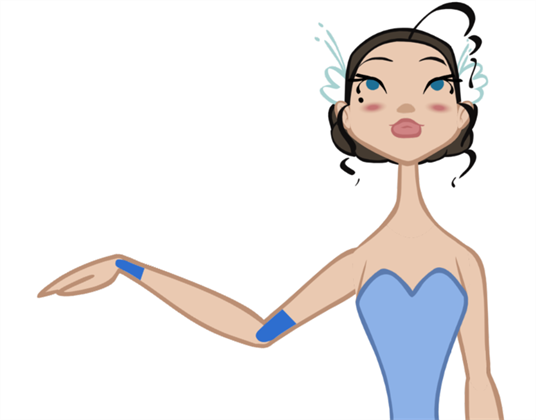 Animate Pro advanced rigging can use an articulation fixing technique called Patch Articulation. This technique is a colour fill patch that is drawn onto a third layer and is used to cover the joint lines. It is a simple, yet powerful method. 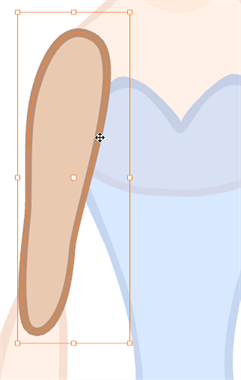 To render this technique even more efficient, Animate Pro lets you draw the patch inside the same drawing, but on a separate contained layer. The Line Art and Colour Art layers are not only useful in traditional ink and paint, but also in advanced cut-out breakdown. You can draw the patch in the Colour Art layer and extract it in the Network view. The advantage of doing it this way is that when animating and using the drawing substitution, the patch drawing will change at the same time as the main drawing. 2. 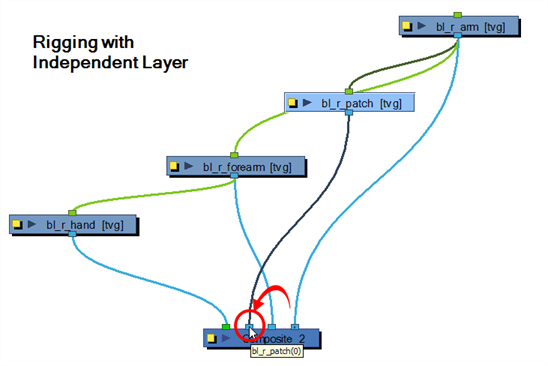 Only if you are planning to create you patch on an independent layer, do the following. If not, move on to the next step. ‣ In the Timeline view, add a new drawing layer by clicking on the Add Drawing Layer button or press [Ctrl] + [R] (Windows) or [⌘] + [R] (Mac OS X). ‣ Rename the new layer patch or elbow. 3. In the Camera view, select the part you want to create a patch for. 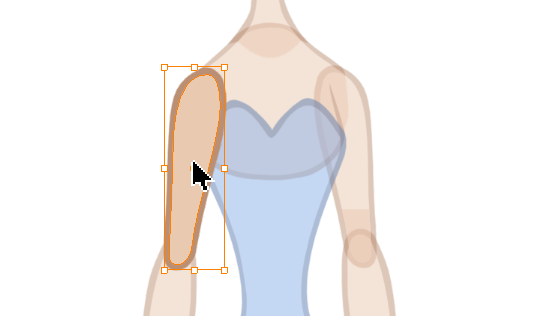 For example, if you are fixing the elbow articulation, select the arm or forearm drawing to edit it. 4. In the Tools toolbar, select the Select tool or press [Alt] + [S]. ‣ In the Camera view, select your pencil lines. 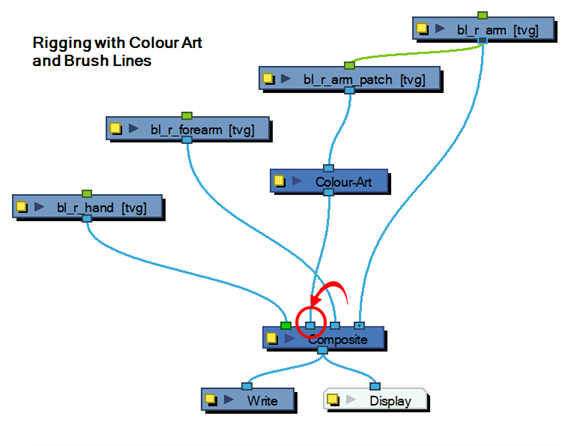 ‣ In the Tools Properties view, click on the Convert Brush Strokes to Pencil Lines button. ‣ In the Tool Properties view, click on the Flatten button. This will remove the exceeding colour fill located under the contour stroke. If you want to keep your lines as pencil and create a patch joint, you will need to use the Auto Patch module. 6. 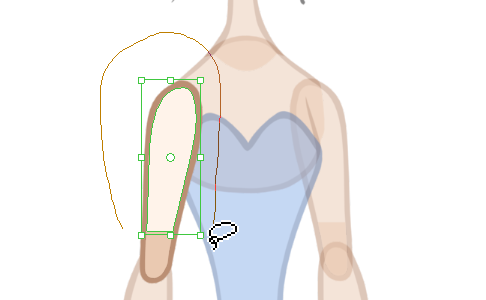 In the Camera view, select the fill zone of the part's drawing. 7. In the Camera view, right-click and select Copy. ‣ If you are using the recommended method, which is to paste your selection in the Colour Art, in the Camera View or Drawing View bottom toolbar, click on the Colour Art button. ‣ If you are using an independent layer, in the Timeline view, select the cell in which you want to create the patch. 9. In the Camera view, right-click and select Paste. 10. In the Tools toolbar, select the Cutter tool. 11. In the Camera view, make a selection around the pasted zone to cut everything out but a small overlapping zone to cover the articulation. 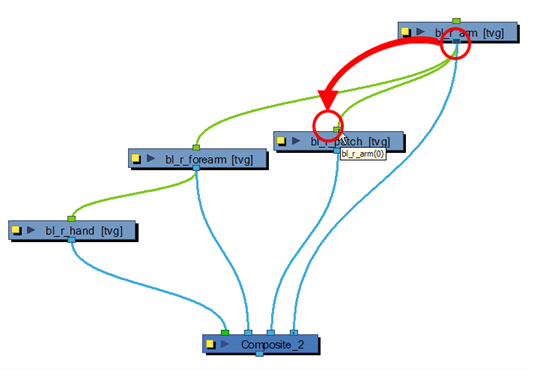 ‣ In the Network view, select the module containing the drawing with the patch. ‣ Copy and paste the selected module. Note that when you copy and paste from the network view, by default it creates a clone, so any changes that are made to one affect the other. ‣ Click on the module's yellow button to open the Layer Properties window. ‣ In the Name field, add the word patch to the module's name. ‣ Close the Layer Properties window. 13. 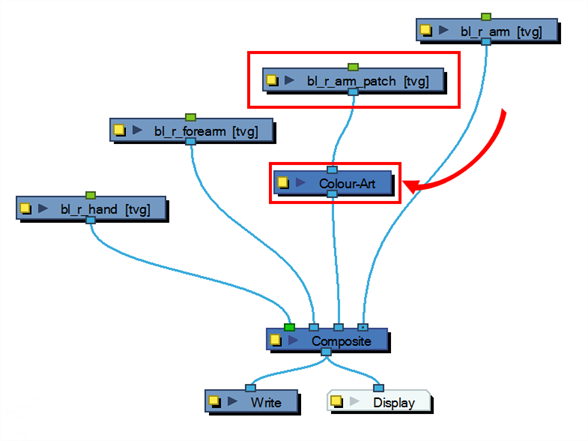 From the Module Library's All Module tab, drag a Colour Art module and connect it below the Patch module. 14. In the Network view, connect the main part you create the patch from and parent it to the patch module. 15. Select the patch module's connection to the Composite module and drag it in front of the piece to be covered. 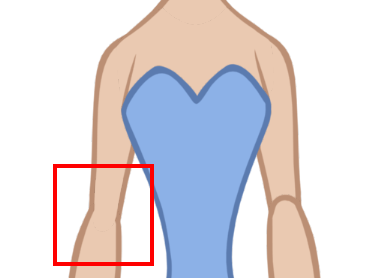 In this case, the elbow patch is parented to the arm and connected in front of the forearm. 16. Repeat the process for each articulation which requires fixing.